In the early 1940s, singers such as Woody Guthrie, Pete Seeger, Josh White and Lead Belly took up political struggles through their music. Folkway Records (USA) and its founder Moses Asch provided the vehicle for many these great folksingers to speak out. They were part of a folksong revival that reached its peak in the 1950s in the US and continued to be popular well into the next decade. In 1987, the Folkways label was donated to the non-profit Smithsonian Institution. Its museum holds the collection and has taken over other smaller labels (including Paredon & Collector), with a commitment to reissue material from its archives with expanded liner notes. More than 3,000 titles are now available through Smithsonian Folkways via on-demand compact disc and on-line digital download and many are available on CDs. 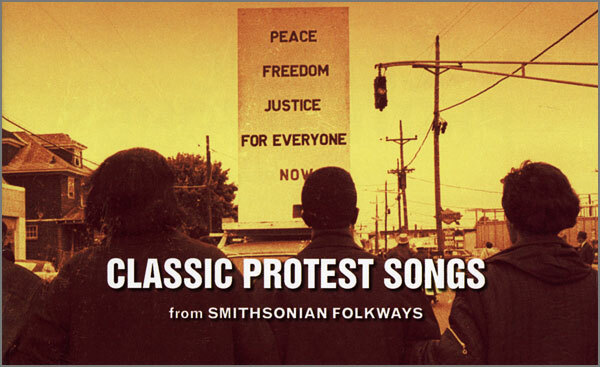 Classic Protest Songs from Smithsonian Folkways is one such CD with a collection of 22 protest songs, a small sample of some of the great artists of that period. There are many more of their works which can be followed up by visiting the museum’s website,www.folkways.si.edu. The songs have been sung in anti-war, civil rights, labour, Indigenous, and other struggles as a means of airing grievances and making demands. Huddie Ledbetter, better known as Lead Belly, performed blues, spirituals, pop songs, and many other styles. He was discovered in prison by researcher John Avery Lomax, and became part of a grouping in New York, which included Woody Guthrie, Pete Seeger, Aunt Molly Jackson, Sonny Terry and Moses Asch. The CD includes his Bourgeois Blues, a song inspired by an incident when he was denied a room in a Washington Hotel because of his colour. Woody Guthrie composed more than 2,000 songs, including the classics, This Land is Your Land and So Long, It’s Been Good to Know You. Here he sings Jesus Christ, a commentary on what would happen if Jesus Christ returned to 1940s America using the melody of the classic folksong Jessie James. Janis Ian composed Baby I’ve Been Thinking at the age of 15. On the theme of inter-racial romance, it was too hot to handle. Twenty-two record companies rejected it before Verve/Folkways released it. It only took off after Leonard Bernstein featured it on his show. She received death threats and razor blades in the post. In the South, it was released under the pseudonym Blind Girl Grunt. Brother John Sellers, a blues and gospel singer performs Lewis Allan’s Strange Fruit, but the lyrics differ from those sung by Billie Holliday. The “strange fruit” are the swinging bodies of the lynched blacks. The song decried racism in the South. It sent a strong message which record companies were reluctant to handle in the early 1960s. John Cohen, Mike Seeger and banjo player Tom Paley came together in mid-1958 to form the New Lost City Ramblers. How Can a Poor Man Stand Such Times and Live dates from the Great Depression and was first recorded by Blind Alfred Reed in 1929. Ry Cooder and Bruce Springsteen also recorded it. Corrido De César Chávez is a tribute to the leader of the United Farm Workers who organised to fight the mistreatment of migrant workers in the US, In 1966, during the Dealano Grape Strike (1965-70) the UFW staged a 300-mile (482km) march. This tribute to César Chávez was composed during the march and is performed by Los Perros del Pueblo Nuevo (The New People’s Dogs). Gone, Gone, Gone by the group Red Shadow is a lively piece written in 1973 that exposes the ruling class and its policies. The chorus line, “But they’ll be gone, gone, gone when the workers take their power away,” leaves no doubts which side they are on. No protest song collection would be complete without Pete Seeger. Like Woody Guthrie he believes strongly in the use of music for the betterment of humankind. He was blacklisted during the McCarthy era but was not silenced. Waste Deep in The Big Muddy was a highly controversial anti-war song at the time. The last line of the song came after Pete had seen a newspaper photograph of troops in the Mekong Delta during the Vietnam War. Other songs include Spirits of the Revolution (Larry Estridge), Evicted Tenant (Sis Cunningham), We Shall Overcome (Guy Carawan), Agent Orange (Peggy Seeger), Talking Pay TV (Phil Ochs) and As Long as the Grass Shall Grow (Peter La Farge). The 70-minute CD comes with a 32-page booklet with notes on the background of each artist and information on the songs along with a few photos. For some, it will be a wonderful trip down memory lane, and for others a new musical experience that was part of the protest movements of the mid-20th century. Copies of the CD are available from the CPA for $20 including packing and postage.